Let’s dream for a moment about sustainable game development. Game development is inherently unstable. Technology, markets, profit margins and teams shift regularly. Any of these can quickly destroy a previously comfortable business. Individual game developers end up dealing with unexpected layoffs, last minute moves across the country (or across the world) and a level of uncertainty can damage our relationships and long term happiness. In order to simply make ends meet, you end up compromising your dreams, for years. Or decades. Game development exemplifies Schumpeter’s creative destruction on an accelerated scale with intensely personal consequences. So what is required to build an oasis? A place where, at minimum, one might make games at least without having your beloved team or your bank account regularly exploded. This essay covers some of numbers behind reaching success as a developer of premium games in the current market. I don’t offer solutions, but you may find some of the concepts useful. For those of you who find your gilded selves in that particular pickle, well done. None of the rest of this essay is meaningful to you. What are the borderline cases? Imagine a glider that slowly drifts downwards, but manage to catch just enough of an updraft to never quite crash. The following are some ideas pertinent to surviving long term in a hit driven media industry. In the 90s, Sierra expected 1 out of 4 games to be a success and pay for the other products that failed to turn a profit. Recently, Mike Capps, the previous president of Epic, claimed that he couldn’t promise more than a 10% chance a game would be a success. If you made 10 games, on average, you’d expect only 1 would be considered a success. Success rate is simply the ratio of ratio games that hit some threshold of financial success vs the total you’ve released. It is never 100% and can range from 1 to 25% based on the particular market you are in. Over time success has been dropping. 25% is almost never seen in modern game markets. Tools are cheaper, distribution platforms are more open and there’s simply a much larger supply of games today than there have been in the past. The number of game players has increased as well, but far slower than the vast increase in developers. Given a set of equally competent games, only a fraction will become profitable. I typically think of success rates in the context of experienced developers. These are numbers coming from professional developers that are already using every trick in the book to mitigate risks. They are making sequels, they are leveraging existing relationships, they are selling to their fan bases. When I talk about probabilities in game development, I’m by no means saying that success is all due to luck. Instead, it is merely acknowledging that even when you do everything you possibly can there are still huge risk factors that are out of your direct control. You might as well plan for only a small chance of success with an individual game. This isn’t being negative. Smart people make good money off probabilistic systems every day. How big of a success is actually a success? There are many definitions of success out there. For the purposes of this essay, let’s consider making enough money to not go bankrupt the first tier of success. At the very least that means paying for your failures. 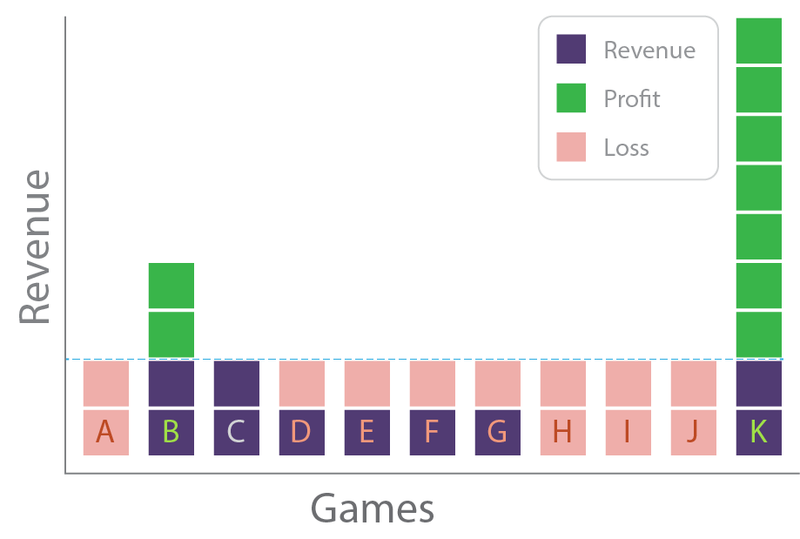 The first thing to realize is that not all profitable games provide long term success. If you make 10 mobile games for $100,000 a pop. Brutal failures: 3 make a total of $153.02. They didn’t get featured by the app stores and were lost in the sea of obscurity. Pretty common, though people tend to be shy about discussing their failures. Moderate failures: 4 make $50,000! Break Even: 2 games break even. Everyone talks about them as if they were a success. Success: Only a single game earns $1 million. It needs to earn 10X its cost to cover your million dollars in total dev costs. What happens if that profitable game make $600,000? It earned 6X its costs! You made a profit of $500,000, enough to make 5 more games. However, you are still on the long road to bankruptcy, despite an apparent success. There’s only a roughly 40% chance those 5 swings at bat will result in a success. Long term, you’ll find yourself out of money or in debt. I regularly hear press or indies trumpeting that a team broke even or doubled their money on a project and I cringe. I’m happy that they got a scratch off ticket to play again. But these are the same developers that are quitting the industry or sunk into despair when a game or two later they’ve run out of money. It is a disservice to other developer to claim that a breakeven project is a financial success. Break even means almost nothing. You are still on the knife’s edge of baseline survival and should operate financially exactly as if you had achieved nothing. Even studios that have successes that are 10X their average project cost still end up going under. Flip a coin 20 times. On every 1 out of 2 times should be heads. But you don’t get a pattern of alternating heads and tails. You get streaks. You may see 10 heads in a row. This is within the bounds of chance. However, if you really needed tails to come up, you are in a lot of trouble. Random systems have natural variability and game development does as well. The best team in the world can strike out 10 times in a row. It is just as likely for your failures to be front loaded as it is for your success. So not only do you need your success to pay for the average rate of failure. You need it to pay for the worst possible luck. The more buffer you have, the longer bad luck streaks you can survive. At the very least, add a few expected failures into your success rate calculation. It isn’t a perfect tactic, but it helps you deal with bad luck in addition to mere average luck. 31 projects started as prototypes. 20 smaller prototypes that also didn't pan out. Some took months, others took days. 4 that didn't make money (both brutal and moderate failures). For us a success means a released project makes back 5 to 10X its production cost. That is what pays for all the prototyping, failed projects and general poor dice rolls. I was surprised to note that of our prototypes, roughly 1 in 10 end up being a successful project. I assumed we had a lot more horrible prototypes than apparently we do. For released projects, we are closer to 1 in 3 being successful. That’s better than expected. But it does make me mildly worried that a bad luck streak is on the way. It would be completely fair to suggest that our successes were front loaded and our actual success rate is lower than the current small sample indicates. However, the most important aspect of these numbers is that we are aware of them. They limit how much we can spend on a project and how much we could keep in reserve. There are a vast number of techniques that help deal with the variability in game development. The following, however, are ones that don’t fundamentally alter the odds. They help you survive the odds, which is a very different goal. Target Revenue: How much do you expect to make? Success Rate: What is chance of making that much money? Your budget is likely Target Revenue * Success Rate. So if there’s a 10% chance of reaching $500,000, you should spend $50,000 on each project. That’s 1 full-time experienced developer for 5 months assume pay of $10,000 a month. Or if you underpay yourself relative to what you might make at comparable jobs and spend 10 months at $5,000 a month. These numbers should look scary. They suggest that the vast majority of indie developers are ripe for financial ruin and are operating primarily on hope instead of any rational financial strategy. I think that’s accurate. Notice that the numbers I shared for concept success rate are quite similar to Mike Capp’s 10%. However, our released games have a much higher success rate (30+%). The reason for this is that we prove out the gameplay early using a low cost pipeline of low cost prototypes. These prototypes cost dramatically less than a released game. Some of those 30 prototypes only took a couple days with a single programmer. By disproving bad ideas early, we put real money into games that have a much higher chance of success. Each time you release a game on a new platform, you get to roll the dice all over again. And you do it a much lower development cost. Triple Town was only a break even game on the eInk Kindle. It was a true success on Android and iOS. If we had stopped after the first release, I would have considered Triple Town a financial failure. Using designs and technology that quickly and cheaply transfer to new platforms reduces your porting costs and decreases the size of success you need to remain in business. One of the trickier aspects of sustainable development is the need to pay for food and housing. What if you can pay for those costs through some other means than games making money? Contracting: You can save up money working for someone else and then spend that money on a period of full-time development. The cost here is two fold. Development goes more slowly and long term you average wage is lower. Working at night: You work a full time job doing something else and then spend evenings and weekends making your game. The cost here is that work goes much slower. It is also not likely to be your best work since it is difficult to maintain quality while working more than 40 hours a week. You also bear the opportunity cost of sacrificing your leisure time to making games. Supportive spouse or family: Someone else in your family makes enough money that you have the leisure to work on games full time. The costs to the artist are generally low. The dominant one is a reduction in household family income. A great situation if you can manage it. We don’t talk about it much, but a large number of successful ‘professional’ artists are in a relationship with someone else that pays their way. They aren’t successful entrepreneurs with a deep understanding of sustainability. Instead they are full-time hobbyists in a fortunate financial situation. They accumulate excess leisure time and spend it on game development. This sort of blessing is very difficult to admit. But embarrassed silence dupes less fortunate artists into pursuing an unrealistic fantasy of how to thrive. If you are a kept developer and are living off someone else’s money, talk about it. Indie finances could use a little sunlight. Premium games tend to have spiky revenue streams focused around launches and special sales. Financial instability is built into the business model. Here are the most common ways of adding a dash of stability. Franchise: A long term game franchise where sales come from promoting sequels or remakes. This tactic is regularly practiced by conservative large companies, but also works for smaller operations like Spiderweb Software. Eternal updating: Continually update a game and making some noise about it. Toss in some sales. For most titles, this tends to drop off after a year or three. A consumable game tends to not be an evergreen business asset. 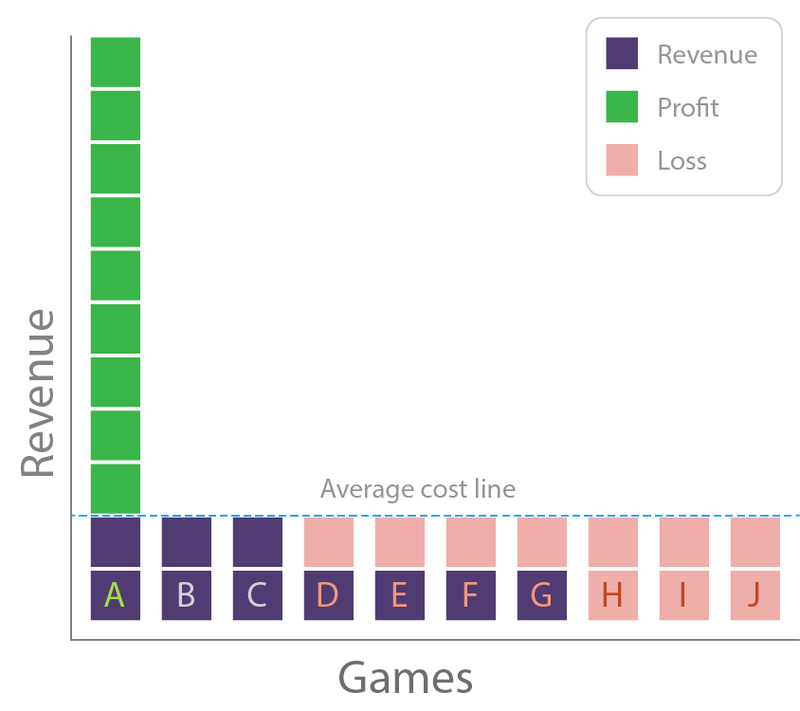 Freemium: Make a game service and build a stream of revenue. This requires that you know how to run a freemium business. It is an uncommon skill set for an indie, but quite valuable. These give you a base layer of predictable revenue. As long as your burn rate as a company doesn’t go wildly over your income stream, you can keep making games. These revenue streams have been our goal as a company. We are looking to build long term games that produce a steady stream of revenue from a community of dedicated players. This isn’t an easy target to hit, but at least we are building games with that conscious aim in mind. The big lesson is that your exposure to luck is something you can manage. Think about releasing a portfolio of games, only some of which will be a success. And you should budget in such a manner that you can afford to make that portfolio. Blowing your existing capital on a single title is almost always a dumb idea. Sometimes it pays off. Most of the time, it doesn’t. However, it is also worth realizing that playing the premium market straight on is, by many measures, a sucker’s game. The standard bet is to lose money on 5 to 10 games and have one success that lets you do it all over again. For most companies, the house always wins in the long run. Perhaps the longer term solution is to run your games as a service. Try to create a product that produces reliable cash flows. This likely require a certain level of business thinking. You are making a financial machine that lasts instead of a Hail Mary piece of art that vanishes.